What do giant radioactive beetles want? Nuclear war! When do they want it? Everywhen! Imagine an 8-foot tall psychic beetle with a bad temper, and you have the ezeru. Evolving to rule the Earth in the aftermath of nuclear war, they expanded their dominion by infesting and colonizing parallel realities - until TimeWatch engineered history so the apocalypse never happened. But a few ezeru remained caught in the time stream, determined to restore their alternative reality; and only you, the agents of TimeWatch, can stop them. 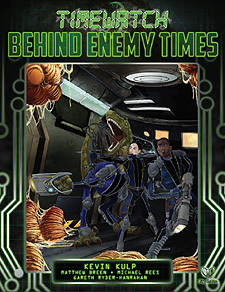 Take on these fearsome insectoid foes in Behind Enemy Times, a series of missions for the TimeWatch Role Playing Game. a 24th-century disembodied brain draws the ezeru's attention when it steals nuclear warheads from the past for its own personal museum. A plague is destroying humanity's greatest thinkers and creators. Who's behind it, and what are they trying to achieve? A rogue memory technician teams up with William Tell to fight oppression throughout history. The agents go deep under cover to infiltrate a rebellion against TimeWatch itself. The Cuban Missile Crisis leads to nuclear war, and following the historical mystery introduces the agents to would-be Presidents, Prohibition-era activists and the most awkward wedding ever. In the explosive finale, the ezeru plan to hatch millions of eggs in the heart of New York City by flooding the city with radiation. Run Behind Enemy Times missions as one shots, or as a campaign run in any order, ending with The Hatching Time. Brave Agents are needed to stand against the ezeru!